Every time I head over to Matthias Wandel’s homepage (or his woodworking site) to see what’s new, I end up spending hours looking through all the cool projects! Seriously, what an awesome maker! I thought I’d share the project that originally drew me to his a site in 2003: a mechanical CD changer/duplicator made mostly from wood and controlled via parallel port under Linux. While I’ve seen a few other CD changer projects, I think it’s safe to say this one is the original (and was probably the inspiration for the rest). I think that every tinkerer should build something like this just because it’s such an interesting problem domain with so many details to consider, yet not insurmountable. 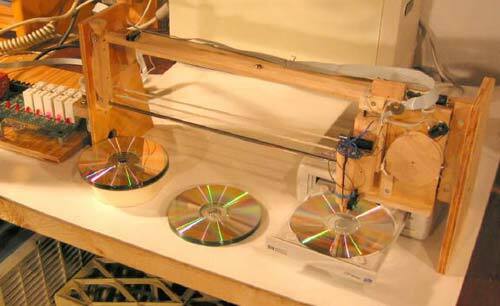 I may just have to start my own CD changing robot this weekend! After you check it out, be sure to poke around his site a while — you won’t be disappointed!